You�re spinning through our solar system on a gorgeous blue marble which offers jaw dropping views of an astronomical phenomenon we call The Milky Way. 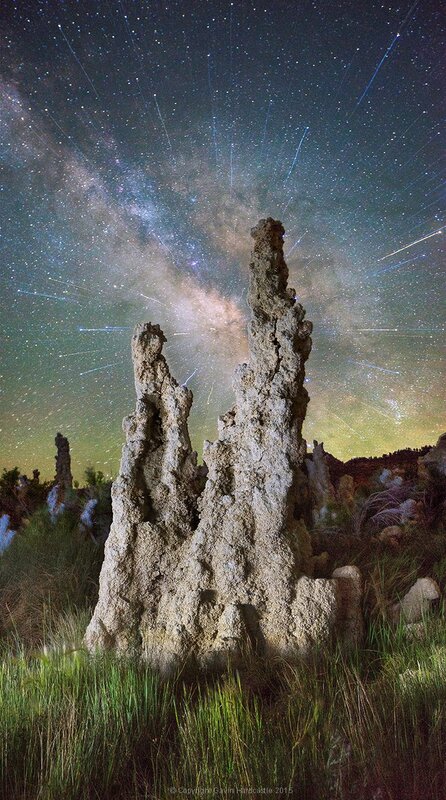 Wait for our marble to line up just right, and you�ll have a perfect opportunity to create awe inspiring images that harness that galactic chandelier hovering over your head. My students are often delighted to learn that capturing spectacular images of The Milky Way is easy, once you know a few essential tips. Planning when and where to do�Milky Way photography is just as important as the techniques and equipment you�ll be using. 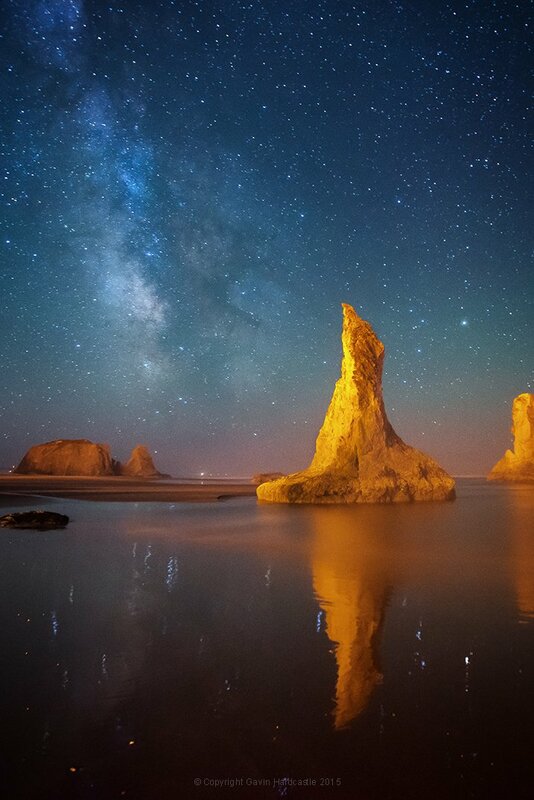 If you want to get truly majestic shots of The Milky Way you�ve really got to consider your location and timing. I�ll tackle that first, before we move on to the shooting technique. The full galactic core is only visible during certain months, at certain locations. You can see the rest of The Milky Way throughout the year, but for truly eye-popping results it�s the galactic core that you�ll be hunting for, so let�s discuss the best times of year to see it in all its glory. Parts of The Milky Way are visible all year round but the galactic core is present only from late April to late July and can be seen in the southeastern to southwestern sky. That�s when you�ll get to see what I call The BIG C. As the summer progresses, you�ll see the core move west so that by the end of summer it appears to rise in the southwestern sky. Photographers who live in the southern hemisphere are lucky because they get to see the core from February right through to October, with peak visibility being in June and July. I�m rather jealous. For super clear Milky Way photography you�ll need minimal light pollution, which�means you�ll want to avoid a bright moon. However, I�ve actually captured good shots of The Milky Way even with a first quarter moon in the sky (so don�t feel like it�s not worth shooting when the moon is present) but obviously a full moon is to be avoided. The other thing to consider is the position of the moon in relation to The Milky Way. For example , a first quarter moon isn�t such a problem if it�s way off in the west while your Milky Way appears in the southeast. But, if the moon lines up dead centre in the Milky Way, it could be too bright, right where you don�t want it. There are a multitude of phone and desktop apps that can help you to plan your Milky Way shoot but my favourite is the free app called Stellarium. There�s a phone and desktop version, I prefer the latter�to plan my shoots. You can enter a location and time to see when and where things are going to line up. You�re mainly looking to see where the galactic core is present during a darker lunar phase. 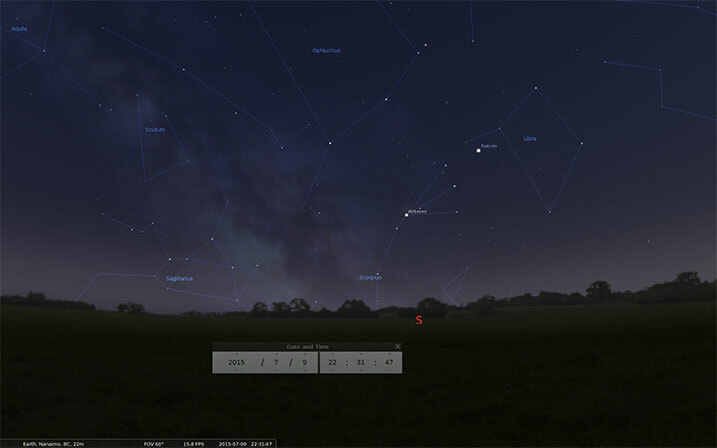 Stellarium will show you a picture of The Milky Way, and its position, at the times you specify. You can also see where and how bright the moon will be. Purists will say that you MUST be in a dark sky area and of course that will give you a much clearer shot, but don�t let a little bit of distant light pollution stop you from shooting The Milky Way. If you can see it, you can shoot it. The image I shot below in Death Valley shows light pollution from two large cities and I honestly think it adds to the contrast in the image. That glow on the horizon adds a�great separation of earth and sky. Most landscape shooters love clouds and hate blue skies. 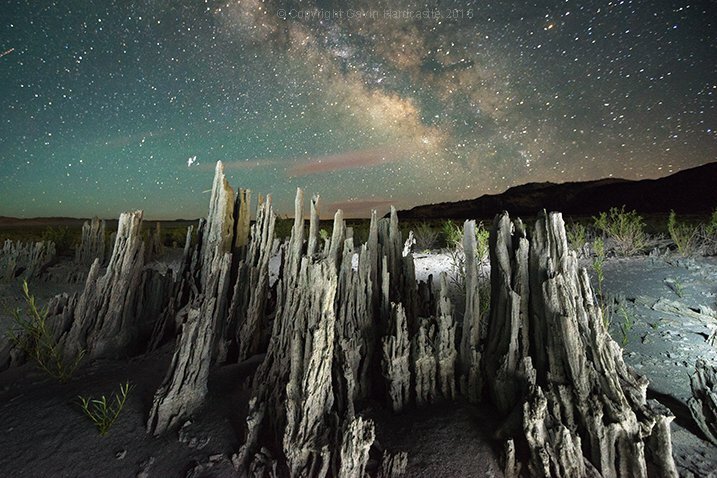 Once you get into shooting nightscapes, you�ll quickly reverse that thinking. A blanket of cloud is bad news if you want to get clear shots of The Milky Way, but don�t be put off by the presence of light cloud cover. Sometimes a few clouds can add drama and framing to a Milky Way shot so it�s still worth shooting if the clouds aren�t completely blanketing the entire sky. 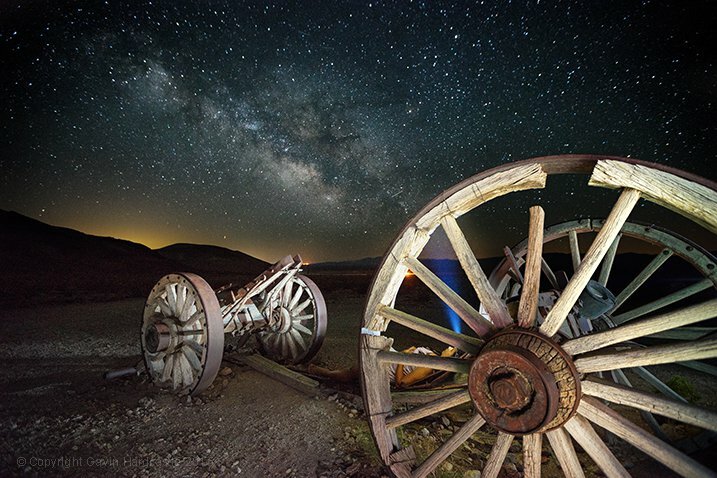 Think hard about what you�d like to put in the foreground of your Milky Way shot. If you get perfect conditions and execute perfect technique you�ll still get a boring shot if you don�t put something else in your frame to ground the viewer. 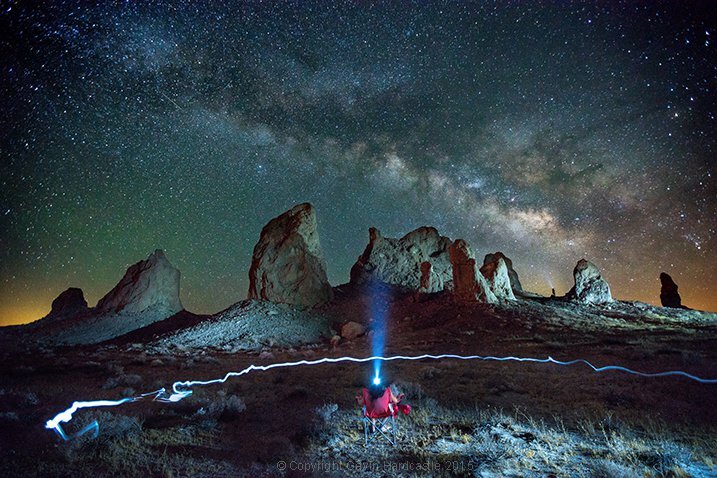 Pick an interesting foreground feature and maybe try a little light painting to make your Milky Way shots truly awesome. While there�s something to be said for using the gear you�ve already got, night photography is something of a challenge because of the absence of light. You�ll need a fast lens that ideally has a maximum aperture of f/2.8, or even brighter like an f/1.4. Super wide angle lenses are ideal for shooting nightscapes because they don�t usually produce much bokeh. By that, I mean that even when set to maximum apertures of f/1.4 you�ll still be able to get a great deal of your image in focus � if you focus correctly. The last thing you want is a sharply focused Milky Way with a foreground that is completely blurred in soft, creamy bokeh, so leave the lovely Sigma 85mm f/1.4 at home. The other great thing about super wide lenses is that you can fit a lot of The Milky Way into your frame, and there�s less magnification which allows for longer shutter speeds before the stars in your shot begin to trail. It�s not the end of the world if you�ve got a standard, all-purpose, kit lens that isn�t very fast. 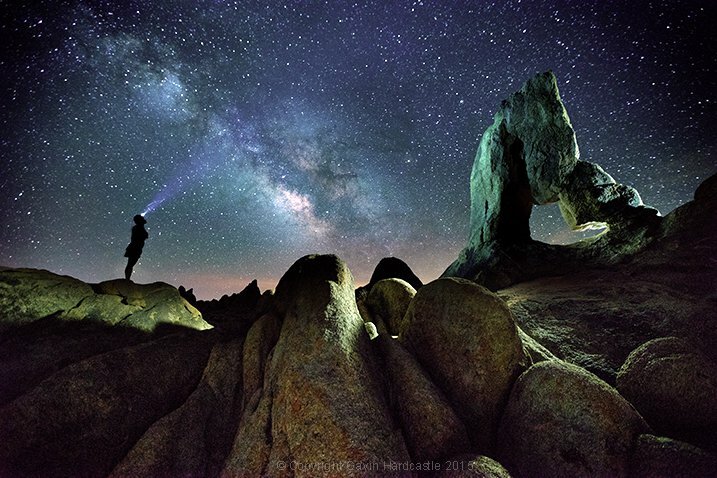 You�ll still get some decent Milky Way shots because you�ll be using long exposures and high ISO settings to maximize your camera�s sensitivity to light. On the left we have the Rokinon/Samyang 24mm f/1.4�($549) which costs a third of the price of the Canon 24 mm f/1.4�($1549). If you really get into shooting nightscapes you�ll be glad to learn that some of the most popular wide angle lenses for nigh photography are actually quite affordable. These are popular because they offer sharpness, speed, a wide field of view, and much less coma than other more costly lenses. Coma is the amount of elliptical aberration around stars in the corners of the frame. Some more expensive lenses, like the Canon 16-35mm f/2.8, have really bad coma on stars in the corner of the frame, which isn�t the end of the world, but it�s not ideal. With night photography you�ll be forced to use high ISO settings during your long exposures so it�s vital to have a camera that can operate at ISO 3200 and above, but more importantly still produce good image quality. No matter what camera you use, the image quality will take a major hit when you start to crank up the ISO numbers, that�s unavoidable. Camera sensors have come a long way in the last couple of years so even if your camera isn�t top of the range you might be pleasantly surprised at the image quality of your high ISO images. 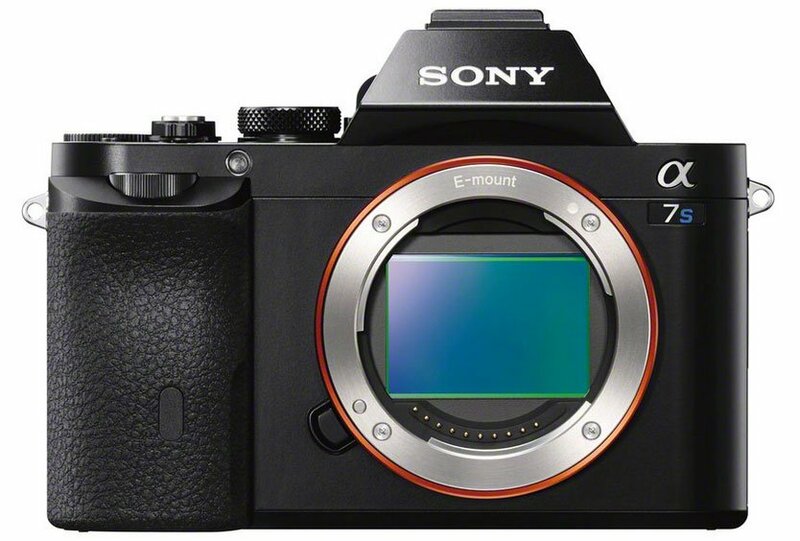 The Sony A7S has become something of a legend among astrophotographers but it isn�t cheap. Some of the best performers of the last couple of years have been the Sony A7R, Nikon D810 and the absolutely brilliant Sony A7S, which is known for its amazing low light capability. These are all full frame cameras, and will deliver the best image quality as they typically offer better noise performance. But if you�re rocking a MFT (mirrorless four thirds) or APS-C sensor, don�t let that stop you from going out and getting some Milky Way action. Don�t feel that you absolutely MUST have the most expensive gear. Work with what you�ve got, then upgrade when you become addicted, and can�t resist the temptation to splurge. The one thing you�re going to really need your camera to have is a good Live View screen or an EVF (electronic viewfinder). You will use this to focus and compose your shots. It�s dark, you�re going to be doing long exposures, and that means you have to use a tripod. Read my article on the reasons why a good tripod is essential for any kind of outdoor photography. For night photography a tripod is obligatory. NOTE: For now you�ll want to turn off your in-camera noise reduction, as this will just slow down your test shots. This is where we�ll set our focus. Make sure you switch auto-focus OFF as we�ll be focusing manually. Before we do this you need to crank your ISO up to something like 5000 to make your sensor really sensitive to light. Using your camera�s Live View or EVF, point it�at the brightest star you can see until a small dot of light appears in the centre of your view. Zoom in (magnify the view NOT zoom the lens) so that you see that tiny little dot as large as possible.�Now turn the focus wheel on your lens until the star becomes a sharp, tiny pin-point of light. Try turning the focus wheel passed that point until the star blurs again and you�ll have gone too far, so just back it up until you�re able to get the star as sharp and small as possible. Don�t rush this, take your time and get it right. If your camera has a feature called Focus Peaking or Focus Assist, that can sometimes help you to determine perfect focus on a star.�If you�re into calculating hyperfocal distance, you could do that too, but I prefer this method. Whatever you do, don�t blindly set your focus to infinity by cranking your focus wheel until it reads Infinity (? ), you�ll just end up with blurred images. Now that you�ve focused your lens on the brightest star, it�s time to compose your shot. Use your headlamp to illuminate the scene so that you can see what you�re looking at in your Live View. If your camera has a digital level for perfect horizon lines use that � if not, you might want to invest in a bubble level for your hot shoe attachment. 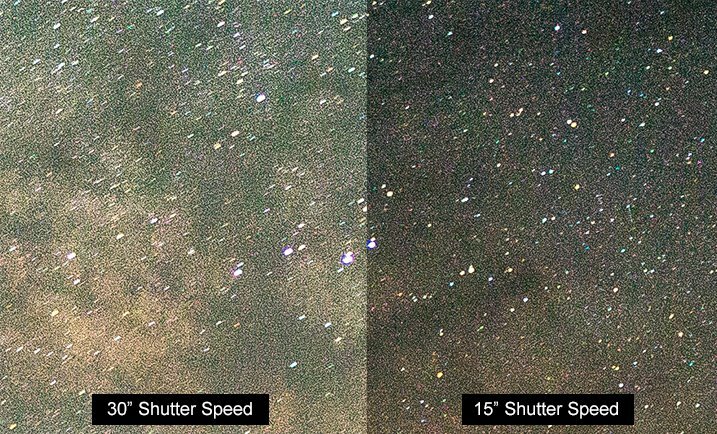 Set your shutter speed to about 10 seconds (at ISO 5000 if you have it), and take a test shot. At this point all you�re doing are some rough test shots to get your composition sorted, so there�s no point in shooting a full 30 second exposure and waiting around while you take a whole bunch of test shots. Once you�ve finished taking test shots and made your final tripod adjustments for the perfect composition, it�s time to dial in your camera settings. When shooting The Milky Way I prefer to shoot with my White Balance set to Incandescent (aka Tungsten) which I believe is Sony�s version of Tungsten. I like the blue hue and it also displays a lot of contrast in my camera�s EVF so that I can clearly see The Milky Way. When I process my images later I often reset the White Balance back to Auto (AWB) mode for a more realistic neutral color temperature. You used ISO 5000 for the test shots so that you could compose your shot quickly. But, for your actual Milky Way shot you want to use the lowest ISO setting you can get away with so dial it down to ISO 2000 and see if that gives you good results. You can always increase it to ISO 3200 after a few more test shots.�I personally rarely go above ISO 3200 as my RAW files tend to degrade significantly at that point. From this point on you�re going to be juggling your shutter speed and ISO setting to get the most light sensitivity, while still having a shutter speed fast enough to avoid getting star trails. Star trails are great if you�re going for the that�effect (read my star trails photography tutorial here) but even a very small star trail just results in a Milky Way shot that lacks clarity. That may just be okay for web images, but for prints you�ll want more sharpness. With a shutter speed of 15 seconds, take a look at your camera�s light meter reading. If it�s telling you that the�image is overexposed you might be able to dial your ISO number down a bit, or shorten your shutter speed to 10 seconds. Sometimes I like to overexpose the image and ignore my light meter reading entirely. When shooting the Milky Way I�m guided more by what I see in my test shots than what my light meter is telling me to do. With my Sony cameras I use Multi metering mode, for what it�s worth. After your shot is complete and you�re reviewing it, be sure to zoom in and check the details. I know I just said to�keep your shutter speed to a maximum of 15 seonds but I always like to take an additional shot with a 30 second exposure to capture a much brighter Milky Way. I do this if I�m planning on publishing a web-only (low resolution) image because the slight star trail caused by the longer exposure won�t be very evident in a low-res web image. The stars will still look sharp enough but will have a much brighter appearance than a 15 second exposure. For prints, I�ll almost always use the 15 second exposure version for the extra sharpness. Some cameras do a great job of processing and reducing noise reduction. But, this will double the amount of time it takes to complete your shot, so it�s always a good idea to switch this function off, at least temporarily. 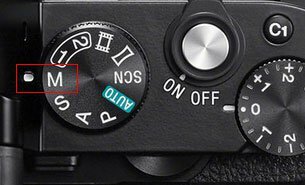 If you like the results of your in-camera noise reduction you can always switch this function back on once you�ve finished all of your test shots. Okay, so now you know how to get gorgeous clear photos of The Milky Way. I hope you get some great results and have as much fun as I do when shooting this awe inspiring sight. If you�d like to learn how I process my Milky Way shots please post a request in the comments and if there�s enough interest I�d be delighted to share my techniques.